Don’t forget to checkout the Renegade Rowing Training Plan for this week and choose which blocks you will hit – RRTP 12-8-14. Today we will work on goblet squats to the erg in the warmup to complement the explosiveness we want in the legs at the catch. We also reviewed the strap drill to feel suspension through the whole stroke. Keep working to turn the legs on and suspend at the catch. 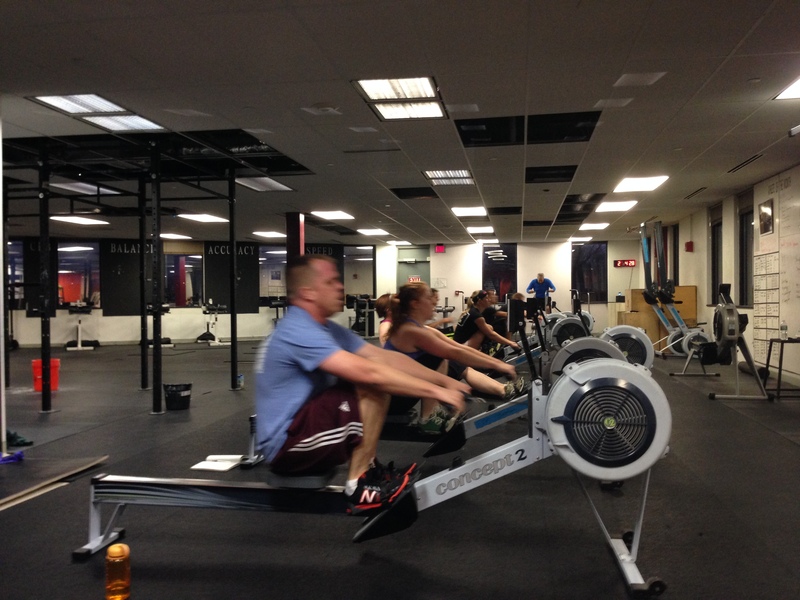 Here is a picture of Renegade Rower Thor getting after that suspension and explosiveness. I guess I was scraping the bottom around 2:07 / 2:08, because I wasn’t able to keep lowering the split on the 5th 800, and I was pushing. Nice work Lauryn! We just need to keep working on your overall strength and power. Your technique is definitely coming along. Keep focusing on preparing that body by half slide. Great execution overall! Well done hitting the stroke ratings and pushing yourself this morning! I started focusing on the s/m and lowering the split closest to 2:14 as possible after each round. I felt I was rushing these and need to be more patient. Took me a while to find the balance with stroke rating and split time. I hear you Linh. It definitely takes practice control both the split and stroke rating however you want. Try closing your eyes and feeling the rhythm and pressure you would like to see. Keep up the good work! You’ll get it! Oh, there were many times I definitely had my eyes closed! I did 12/10: 3 of 4x10min w/3min rest @ 26 after “DT” (extra spicy) today…. Haha Nice! Solid morning Linh! Keep it going!